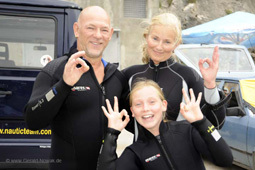 Come and join our “Family Dive Adventures” and “Family Weeks”. Frequently held during the summer months. Created especially for our youngsters! The Adventure, the underwater exploration, the understanding of our environment/awareness, working in a team and overall safety. All of this comes with an extra portion of fun. Practical lessons in shallow waters. Training is conducted in either a pool or pool like conditions. The water temperature should be a minimum of 25 degrees. Dives are always conducted with full equipment including a neoprene suit. Maximum dive time is 25 min. The student should be able to swim a distance of 25 meters or over. A maximum depth of 5 meters. The dives are conducted in protected shallow waters, using different locations with various bottom compositions such as sand, pebble, silt, rock and flora. Be able to descend head and/or feet first. Be able to maintain proper buoyancy. Be able to achieve underwater skills such as mask clearance, take it off and put it back on. Be able to breathe for at least one minute without the mask, and some more….. The student has to have a good command of all the skills practiced in the Junior Diver Course. Training is conducted in shallow open water at a maximum depth of 10 meters. Maximum 1 dive per day. Learns to practice a buddy check prior to each dive and repeat the exercise a 3 meter underwater. 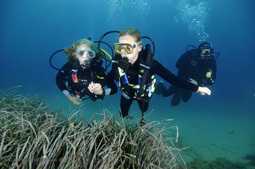 The student learns the physical basics of buoyancy and its influence on diving, i.e. weights/suit. Learns about safety and how to avoid possible injuries such as baro trauma, with more detail given to barotrauma of the lungs, mask hematoma and disrupted eardrum. Familiarization with some definitions of anatomy, such as Eustachian tube, eardrum, middle ear. Understand the behavior of living organisms under water, coral, etc….. 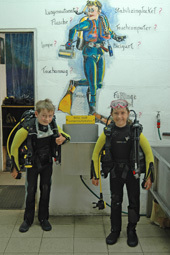 The student has to have a good command of all the skills practiced in the Junior Scuba Diver course. Specialities and Certifications for Juniors. After the Junior Diver children can further their education on various specialties such as Peak Performance Buoyancy, Boat Diving, Naturalist and many more. Please don’t hesitate to ask us if you need further information. Get yourself the 5% Voucher on the next course. Just click on the “Worm”, print it and bring it over!